This crispy dish is such a treat – and it's great with chicken wings and prawns as well. Quarter the quails, removing backbones and wing tips. Clean insides, pat dry with paper towel. Dry-roast salt and Sichuan peppercorns in a heavy-based pan. When peppercorns begin to "pop" and become aromatic, take off the heat. Allow to cool, then grind to a powder using a mortar and pestle or a spice grinder. Mix the Sichuan salt mix with the sugar, soy sauce and Shaoxing until the sugar dissolves. Add the quail pieces, toss together and marinate overnight. Heat the oil in a wok or deepfryer until just smoking (180°C on a thermometer). Coat each quail piece in flour, shaking away any excess, and deep-fry in batches until golden brown (about 5-8 minutes each). Remove from the wok and drain on a paper towel. For the cabbage, clean the wok and reheat until just smoking. Add the peanut oil and, when hot, stir-fry the ginger and garlic until fragrant. Add the cabbage, stir-fry for one minute, then deglaze the wok with the Shaoxing. Add the black vinegar, white vinegar, palm sugar and oyster sauce and cook for another minute. Spoon the cabbage onto a large serving plate. 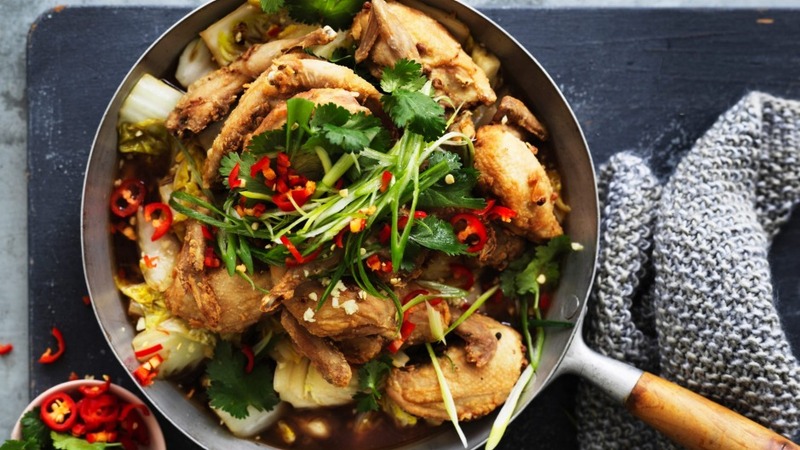 Arrange the quail pieces on top and sprinkle with the combined spring onion, coriander, chilli and garlic. Serve with chilli sauce on the side.